This is the larger version of our famous baby name seat. 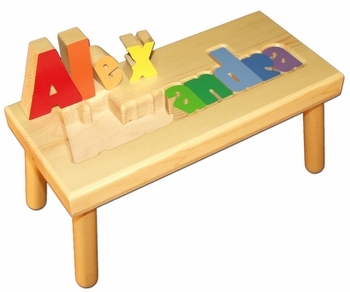 Constructed from solid wood this functional toddler step stool seat incorporates the little one's own name as a colorful puzzle on top! Not every child's name could fit on the original version so this seat can accommodate a name with 14 letters or 13 letters with two names. Engrave birth information or your personal message on bottom of stool for a special touch. Name comes with either primary color letters (as shown) or pastel color letters. See More Images above for pictures of the pastel version and examples of the personalized engraving option.